Silly Bandz are rubber bands made of silicone rubber formed into shapes including animals, objects, numbers, and letters. They are distributed by BCP Imports and are normally worn as bracelets. Silly Bandz retail in packages with themes, such as princesses or animals, and fashion accessories. Similar shaped silicone bands are also available under other brand names from a variety of companies. Silly Bandz are an iconic piece of pop culture and were very popular in the early 2010s. 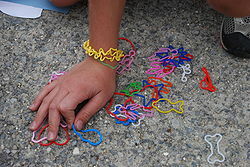 The first Silly Bandz sets were sold online in November 2008. In early 2009, Learning Express in Birmingham, Alabama became the first retail store to stock Silly Bandz. By fall they were a strong seller, and became widespread across the Southern United States. Popularity began to move up the East coast of the United States, reaching New Jersey, Long Island, and Staten Island in November the same year. Silly Bandz are sold in packages with different themes, including princesses and animals. In August 2010, Silly Bandz sold their product in 8,000 stores across the U.S., and many stores in Canada carry Silly Bandz too. In September 2010 Quiznos had Silly Bandz in their kids meal. Seven spots on Amazon's April 22 list of best-selling toys and games were occupied by the bracelets. By December, Sillybandz controlled the top 25 list of toys for Amazon.com  One December 2010 article said that brands like Logo Bandz, Cool Bandz, Zany Bandz and Googly Bandz, sold by Wal-Mart, were easier to find than Silly Bandz. In late 2010 and 2011 Silly Bandz released themed packs in collaboration with celebrities like Justin Bieber and Kim Kardashian. In late 2011 Zoo Games released video games based on Silly Bandz for Nintendo DS and iPhone. In spring and summer 2011 Winter's brand chocolates of Peru included Silly Bandz, marketed in South America as Animaligas, in displays and packages of Chin Chin chocolates. One parent attributed the toy's success to their being easily lost and broken, and said that, "If your friend has the princess kind, then you have to have the princess kind, too." Seth McGowan, a toy industry analyst for Needham & Company, said it is refreshing that the "lowest of technologies" is also the one that is the most appealing, to children. Silly Bandz have been banned in many classrooms for being too distracting, with students trading them with each other during class. ^ Marek, Alison (December 2009). "Rubber Band Wars Break Out in Specialty". Toy Directory. Retrieved 12 November 2011. ^ a b c "Animal Rubber Bands - Zoo". Toy Directory. Retrieved 12 November 2011. ^ "animal rubber band [+d.]". Plus-D. Retrieved 10 April 2011. ^ "August Peeks". Toy Directory. August 2011. Retrieved 12 November 2011. ^ "Silly Bandz all the rage this holiday". ^ Berfield, Susan (2010-06-10). "The Man Behind the Bandz". BusinessWeek. Retrieved 2010-08-19. ^ "WHOIS Results for silly bandz.com". ^ Wellington, Elizabeth (2010-05-12). "It's all on the wrist: Bands are ultra cool | Life". Houston Chronicle. Retrieved 2010-08-19. ^ a b c d George, Tara (April 16, 2010). "Silly Bandz, the Bracelets That Spring Off Shelve". The New York Times. Retrieved April 24, 2010. ^ "Quiznos Silly Bandz Kids Meal - Sillybandz Blog". Retrieved April 7, 2011. ^ Janes, Théoden (April 22, 2010). "Silly bandz = serious business". The Charlotte Observer. Retrieved April 24, 2010. ^ "Silly Bandz". Galesburg Register-Mail. December 12, 2010. Retrieved January 5, 2010. ^ "Kardashian Silly Bandz Coverage - Sillybandz Blog". Retrieved April 7, 2011. ^ "Justin Bieber Silly Bandz - Sillybandz Blog". Retrieved April 7, 2011. ^ "IGN: Silly Bandz". Retrieved December 31, 2010. ^ "Promoción Chin Chin Animaligas" (in Spanish). Promo Gana Perú. ^ Rochman, Bonnie (May 25, 2010). "Silly Bandz Banned — What's a Schoolkid to Do?". Time Magazine. ^ "Some Wichita-area schools have opted to ban Bandz". The Wichita Eagle - Kansas.com. October 4, 2010. Wikimedia Commons has media related to Silly Bandz. This page was last edited on 11 April 2019, at 23:26 (UTC).